2) Features: Exquisite color, high saturation, environmentally-friendly, waterproof, unfading, acid and alkali resistant. 3) Applications: covered by vacuum machine on the surface of various boards, such as MDF, veneer boards, flake boards, fiber boards,block boards and other materials of high-pressure floor slabs, asbestos boards, slates, aluminum and plastic profiles which used for indoor decoration and furniture making industry. 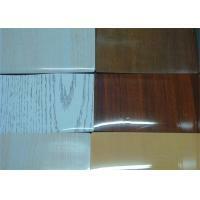 4) Advantages:PVC decorative film is a kind of new environmentally-friendly material. It is waterproof, acid and alkali resistant, and will be extinct once away from fire. As it is unfading,it could be simply operated without any paint, which not only shortens the time limit of a project but also cuts down the cost.Without the smell of paint,it is really an ideal material for indoor decoration and furniture making industry. used for paint free of indoor decoration and furniture making industry. Packed in rolls. Several rolls are packed on a wood pallet (1.1m*1.1m or 1m*1m), and then wrapped with transparent film. Data(pattern number, reel in number, quantity)about each roll will be printed on A4 paper then labeled on four sides of the wrapped pallet. Packing for each roll: Outside-- It is packed by film with LONGYANG’S label on the surface and paper board at each end of the roll. Inside-- It is packed by paper pipe. payment By T/T.conditions must be exactly discussed. Product category Wooden grain PVC film, High gloss PVC film, Semimatte PVC film, Matt PVC film, PVC metallic film , PVC laser film,self-adhesive glass film etc.